The Trump administration is not sure whether it will stay in Syria for the long-haul, but that hasn’t stopped U.S. service members from reinforcing their positions around the northern Syrian town of Manbij. 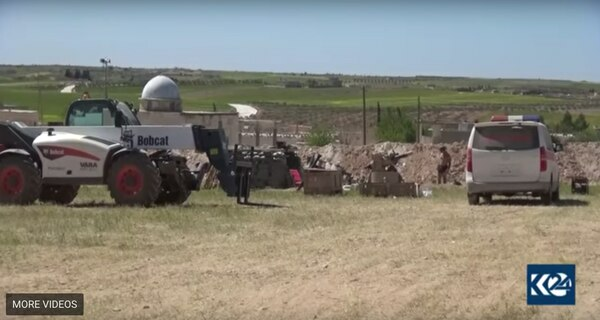 In pictures and video that first surfaced on Kurdistan 24 — a news outlet in the region — U.S. forces appear to be flexing mine-resistant vehicles, weapons assets and construction equipment to Manbij in order to reinforce two bases there. One such video shows a U.S.-led coalition member setting up an XM905 Advanced Mortar Protection System, or AMPS, a Green Beret weapons sergeant familiar with the system confirmed to Military Times. The system is “used mostly for base defense” and was put up at many forward operating bases across Afghanistan for indirect fire support, the Green Beret said. It’s “heavy, so it’s just meant to stay in place and protect the base,” he added. However, the system is “not likely” to be given to partner forces to use or train with, the Green Beret said. Instead, AMPS is meant to be used to protect American positions and maybe NATO allies, he added. AMPS is a dismounted 120mm mortar system. The system has a recoil design, which reduces shock and improves accuracy, according to the Army. It also has an electric drive system, providing a 360-degree firing range, and allows for computerized laying of the cannon’s azimuth and elevation. All of this makes the system “capable of providing an accurate solution when emplaced on a sloped terrain,” according to the Army. This recoiling mortar was originally designed for the M1129 and M1252 Stryker Mortar Carriers, but was later adapted for the ground-based system seen in the video footage. Photos from Manbij across social media show two coalition bases heavily laden with American flags and occupied by Mine-Resistant Ambush Protected vehicles, or MRAPs, as well as a lighter, more maneuverable variant called the Oshkosh M-ATV. The build-up comes days after an American and a British operator were killed by an improvised explosive device while conducting a mission in an urban area of Manbij on March 29. During that same incident, five other coalition troops were wounded. The coalition forces were conducting a raid to kill or capture a known member of the Islamic State. Still, the build-up should not signal much more than a reflexive posture after the incident, as well as other threats in the region, according to Eric Pahon, a Pentagon spokesman. “We are continuing to implement the president's strategy to defeat ISIS. We will, however, continue to evaluate our posture with respect to conditions on the ground,” Pahon added.